Apple announced a slew of new things this week and if there’s one thing we can be sure of it’s that it’s all part of an insidious plot to keep you buying more. 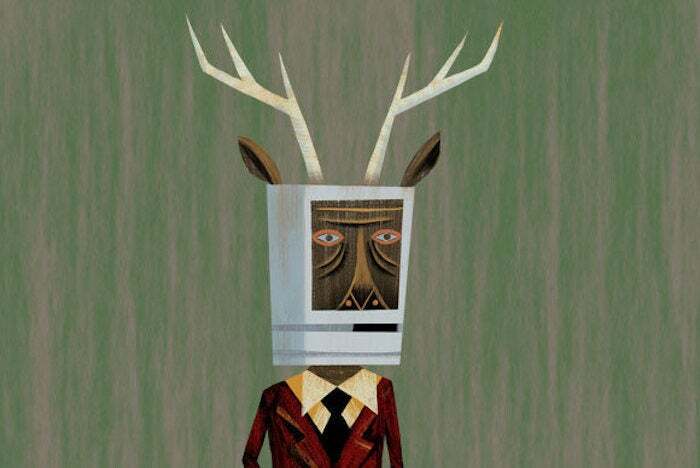 The image accompanying the article is an amalgam of the Apple logo and—and here the Macalope is required by law to note that he is not kidding—the Hydra logo. Because nothing says fascism like a lease with an option to buy. OK, sure, it’s a slippery slope, but that’s still pretty far uphill. What is the best way to pay for a $1,200 iPhone? Duh. Come on, ask a hard one. No, that’s literally what it is. Ostensibly it’s an “upgrade program” in which you get a new iPhone every year. But you have to sign a new contract every time. Anyway, please continue. Actually, no, wait, because this is important and Beres has it a bit backwards here. Let’s say you wanted to keep your iPhone for two years and you wanted AppleCare+. In that case, because the iPhone Upgrade Program is a zero-percent loan over 24 months for the combined cost of the phone and AppleCare+, not only is it not a bad way to buy an iPhone, it’s the best way to buy one because of the time value of money. Now, maybe you don’t want AppleCare+ or maybe you don’t want to get locked into a plan or maybe you’re on T-Mobile and John Legere is making another craaaazy deal of the week the Macalope doesn’t know about, but under some circumstances it’s a great way to buy an iPhone. Oh, sorry, though. Forgot about the insidious plot part. …it’s designed to lock you in forever. OMG, don’t nobody tell Damon about cell phone contracts. Would Apple prefer you keep re-upping for two more years every year when a new iPhone comes out? Sure! But you don’t have to. That may be an agreeable prospect for anyone who imagines they’ll never want a smartphone that isn’t branded by Apple, but ceding more of your life to yet another gilded monolith in Silicon Valley—well, we wouldn’t recommend it. Choice is good, but many people are fairly certain they’re going to stick with iPhones for a variety of reasons ranging from personal preference, ecosystem lock-in and not wanting to do business with questionable companies that sell exploding phones. But, if you suddenly decide in the middle of your contract that you’ve had enough of Eddy Cue (it happens), guess how much a flawless 32GB iPhone 7 is going for on Gazelle right now? $329. Exactly half the list price. Sure, you’d be out half the $129 for the AppleCare+ if you bought out of your Apple contract and sold the phone to Gazelle, but there are other ways to sell an iPhone in which having AppleCare+ coverage garners a premium. If you don’t upgrade every year and choose instead to pay off and own your iPhone after two years, you’re getting screwed. How are you getting screwed?! You paid exactly as much as you would have paid up front. That’s what the 0 percent part means! Beres lists his problems with the plan. The iPhone Upgrade Program keeps you locked into Apple’s ecosystem. If you can upgrade to a new iPhone every year, with no obvious downside, why wouldn’t you? You’re asking the Macalope?! He doesn’t know! The point is, though, you can get out of it and possibly with no penalty. You’ll keep buying new iPhones. What if you already were buying new iPhones anyway? Apple gets your old iPhone, which it can refurbish, and re-sell. Maybe it’s not fair to call this “greedy,” exactly. Although, screw it, it’s greedy. Except you paid exactly what you would have paid if you’d bought yourself out of the plan and sold the phone. What do you think Gazelle does with the phones they buy? Make low-income housing out of them? No, they sell them. And while they sell them for 30 percent off the list price instead of Apple’s 15, Apple’s refurbished phones are sold with the full 1-year warranty. Gazelle only gives you 30 days. It helps Apple control, and drive up, the base price for the iPhone. Beres provides a chart that shows the average price of iPhones going up after 2014 which certainly has nothing to do with the introduction of the larger iPhones that pundits were screaming that Apple had to ship or PERISH IN THE HOLY FLAMES OF PERDITION FOR ALL ETERNITY and everything to do with the Upgrade Program. If you were to buy an iPhone X for $1,200 outright, you would be able to resell it for a substantial portion of what you originally paid. You can do that with the iPhone Upgrade Program. You own the phone if you finish out the 24 months or if you buy it out before then. The one thing Beres doesn’t mention in all this is that you’d have to have the cash on hand to buy the phone up front. Many people don’t have that much just lying around, which is why these plans are so popular. The iPhone Upgrade program certainly does remove flexibility, but for many people, it’s a perfectly good program.